Reading and share top 10 famous quotes and sayings about The Immortality Of The Soul by famous authors and people. Browse top 10 famous quotes and sayings about The Immortality Of The Soul by most favorite authors. 1. "What is it that sometimes speaks in the soul so calmly, so clearly, that its earthly time is short? Is it the secret instinct of decaying nature, or the soul's impulsive throb, as immortality draws on? Be what it may, it rested in the heart of Eva, a calm, sweet, prophetic certainty that Heaven was near; calm as the light of sunset, sweet as the bright stillness of autumn, there her little heart reposed, only troubled by sorrow for those who loved her so dearly." 2. "In how many families do you hear the legend that all the goodness and graces of the living are nothing to the peculiar charms of one who is not. It is as if heaven had an especial band of angels, whose office it was to sojourn for a season here, and endear to them the wayward human heart, that they might bear it upward with them in their homewoard flight. When you see that deep, spiritual light in the eye,---when the little soul reveals itself in words sweeter and wiser than the ordinary words of children,---hope not to retain that child, for the seal of heaven is on it, and the light of immortality looks out from its eyes." 3. "She had lost herself in this old work, her personality dissolving into it, so that she had been set free. The immortality of the soul lies in its dissolution; this was the cryptic comment that so frustrated Olivier and which Julien had only ever grasped as evidence for the history of a particular school of thought. He had known all about its history, but Julia knew what it meant. He found the realization strangely reassuring." 4. "Let not the rash marble riskgarrulous breaches of oblivion's omnipotence,in many words recallingname, renown, events, birthplace.All those glass jewels are best left in the dark.Let not the marble say what men do not.The essentials of the dead man's life--the trembling hope,the implacable miracle of pain, the wonder of sensual delight--will abide forever.Blindly the uncertain soul asks to continuewhen it is the lives of others that will make that happen,as you yourself are the mirror and imageof those who did not live as long as youand others will be (and are) your immortality on earth." 5. "The temporal immortality of the soul of man, that is to say, its eternal survival also after death, is not only in no way guaranteed, but this assumption in the first place will not do for us what we always tried to make it do. Is a riddle solved by the fact that I survive forever? Is this eternal life not as enigmatic as our present one? The solution of the riddle of life in space and time lies outside space and time." 6. "Glenn used to say the reason you can't really imagine yourself being dead was that as soon as you say, 'I'll be dead,' you've said the word I, and so you're still alive inside the sentence. And that's how people got the idea of the immortality of the soul - it was a consequence of grammar." 7. 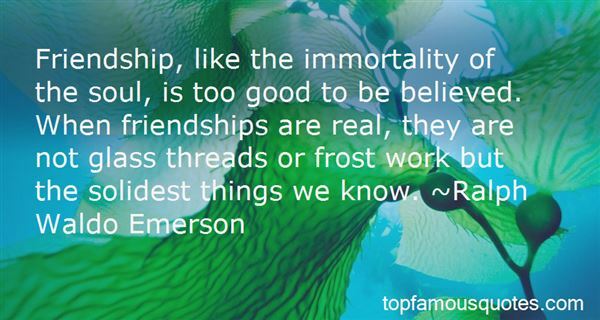 "Friendship, like the immortality of the soul, is too good to be believed. When friendships are real, they are not glass threads or frost work but the solidest things we know." 8. "You know, the immortality of the soul, free will and all that -- it's all very amusing to talk about up to the age of twenty-two, but not after that. Then one ought to be giving one's mind to having fun without catching the pox, arranging one's life as comfortably as possible, having a few decent drawings on the wall, and above all writing well. That's the important thing: well-made sentences...and then a few metaphors. Yes, a few metaphors. They embellish a man's existence." 9. 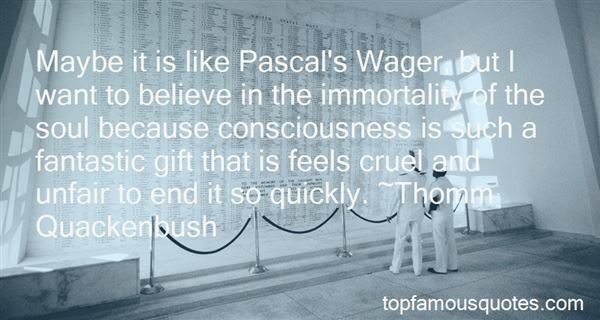 "Maybe it is like Pascal's Wager, but I want to believe in the immortality of the soul because consciousness is such a fantastic gift that is feels cruel and unfair to end it so quickly." 10. "That human life is but a first installment of the serial soul and that one's individual secret is not lost in the process of earthly dissolution, becomes something more than an optimistic conjecture, and even more than a matter of religious faith, when we remember that only commonsense rules immortality out." I have outlasted all desire,My dreams and I have grown apart;My grief alone is left entire,The gleamings of an empty heart.The storms of ruthless dispensationHave struck my flowery garland numb,I live in lonely desolationAnd wonder when my end will come.Thus on a naked tree-limb, blastedBy tardy winter's whistling chill,A single leaf which has outlastedIts season will be trembling still."